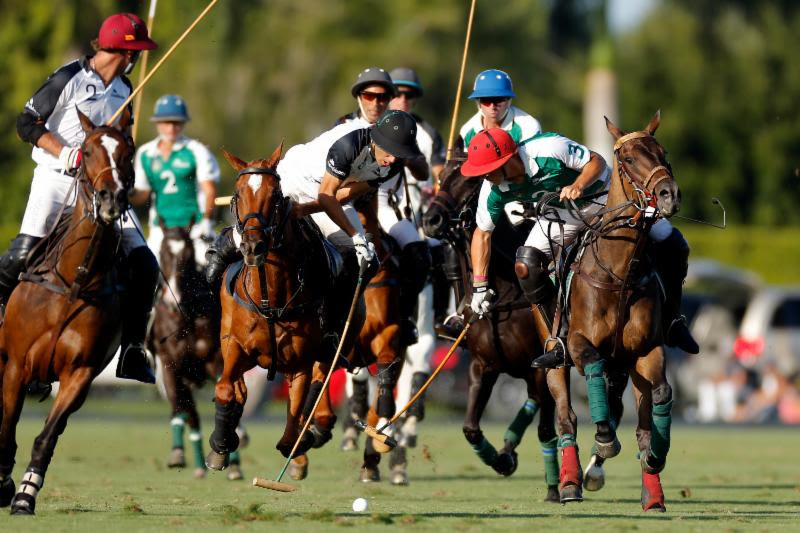 Wellington, Fla. – Feb. 25, 2017 – Friday’s double-header opening day of the 2017 Iglehart Cup unfolded the same way so many games have in this season’s 20-goal series at the International Polo Club Palm Beach (IPC). After back-and-forth dances down to the wire, both games rolled spilled into overtime. Mt. Brilliant defeated Goose Creek, and Equine Liquid Biocell bested Tonkawa, both games ending 10-9. In the first chukker of their game, Mt. Brilliant committed four fouls, leading to two penalty opportunities for Goose Creek. After Tomas Garcia del Rio missed the first attempt, Mariano Gonzalez converted the penalty 3 to give Goose Creek a 1-0 lead. Mt. Brilliant only managed one shot on goal and missed their only penalty attempt in the opening chukker, keeping them off the scoreboard. 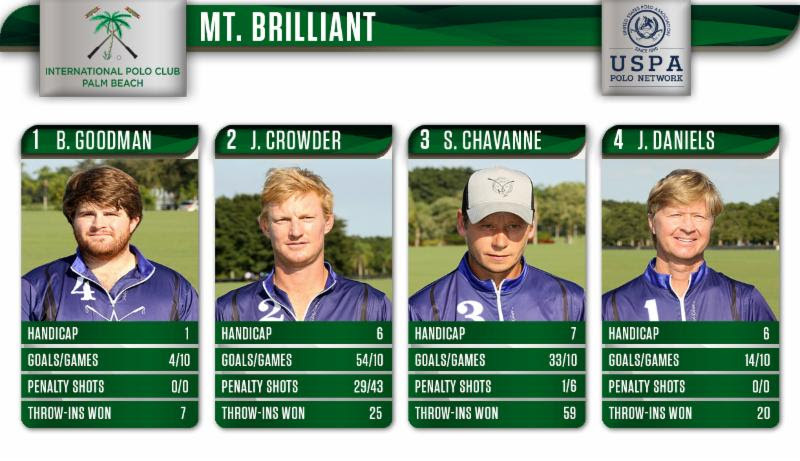 In a clean second chukker with zero combined fouls, Santiago Chavanne finally got Mt. Brilliant a goal, converting 1 of Mt. Brilliant’s 3 field goal attempts. Goose Creek answered with back-to-back goals from Tomas Garcia del Rio to get a 3-1 edge. The low-scoring affair continued, with very few fouls committed in an open-style game with neither team converting many chances. Goose Creek shot 3 of 9 (33%) in the opening half, while Mt. Brilliant shot 2 for 5 (40%). 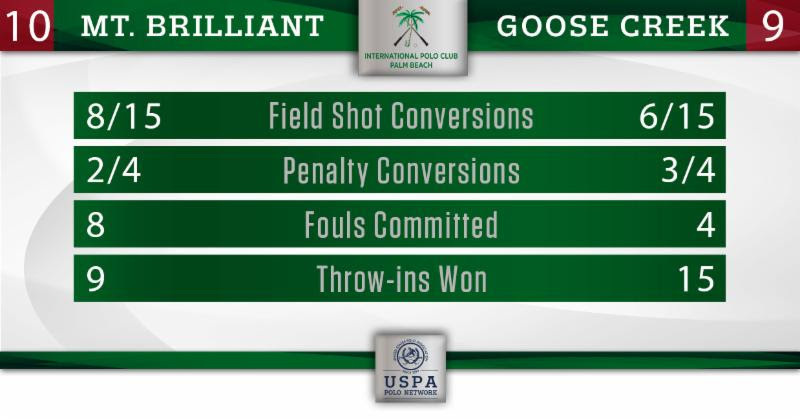 Goose Creek held on to their lead after the third chukker and took a 4-2 advantage into halftime. 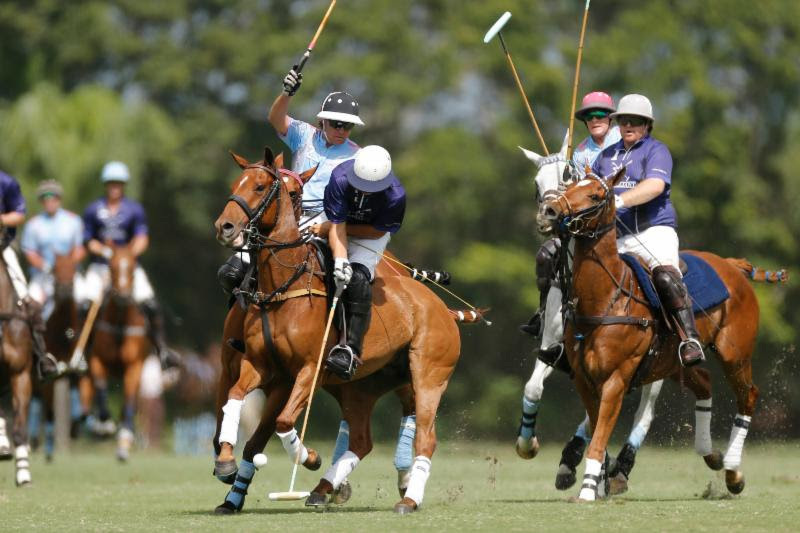 Scoring picked up in the fourth chukker with both teams scoring two goals from the field (Mariano Gonzalez scored both for Goose Creek, while Chavanne and Julian Daniels each scored one for Mt. Brilliant). 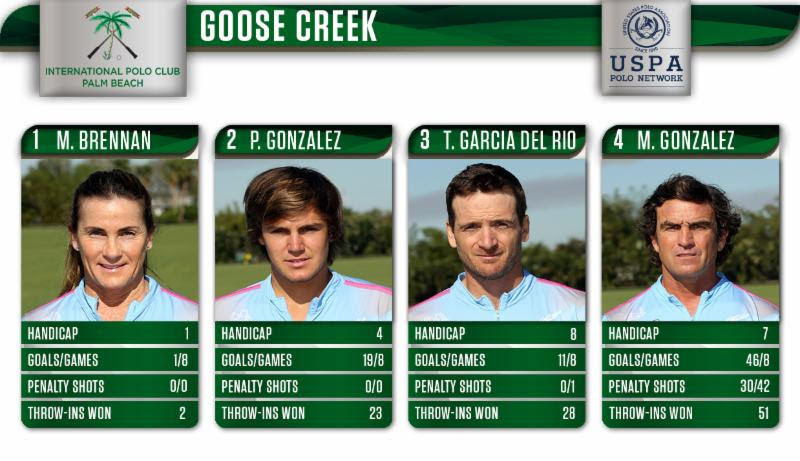 Through the fifth chukker there had only been a combined 7 fouls, with Goose Creek only committing 1 foul as a team, which kept one of the leading scorers of the 20-goal season, Jason Crowder, off the penalty line. The sixth chukker was a different story. Three Goose Creek fouls led to two penalty goals for Crowder (his first goals of the day), as Mt. Brilliant tied the score, sending the game to overtime. In overtime, Mt. Brilliant controlled the play. Crowder finished off a run, putting the ball through the posts for his fourth straight goal to lead his Mt. Brilliant team to a 10-9 victory. A matchup between two 10-goalers, Hilario Ulloa and Sapo Caset, saw another close game. Neither team was ever up by more than two goals. 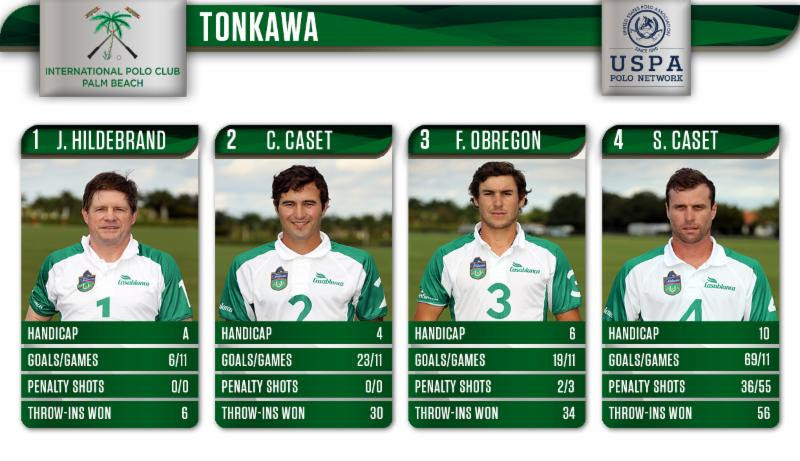 Tonkawa controlled open play early on as Facundo Obregon and Sapo Caset scored a goal each from the field, but 2 fouls in the first chukker from Tonkawa gave Hilario Ulloa two penalty attempts. After missing a penalty 4, Ulloa converted a penalty 3 for his first goal of the day as Tonkawa led 2-1. The second chukker was all Equine Liquid Biocell. They won 4 of 5 throw-ins and shot at goal four times but only converted 1 of those 4 shots, with Agustin Obregon scoring his first goal of the day. However, foul trouble from Tonkawa once again put the dangerous Ulloa on the penalty line. He converted two more penalty attempts to give his team the 4-3 lead. 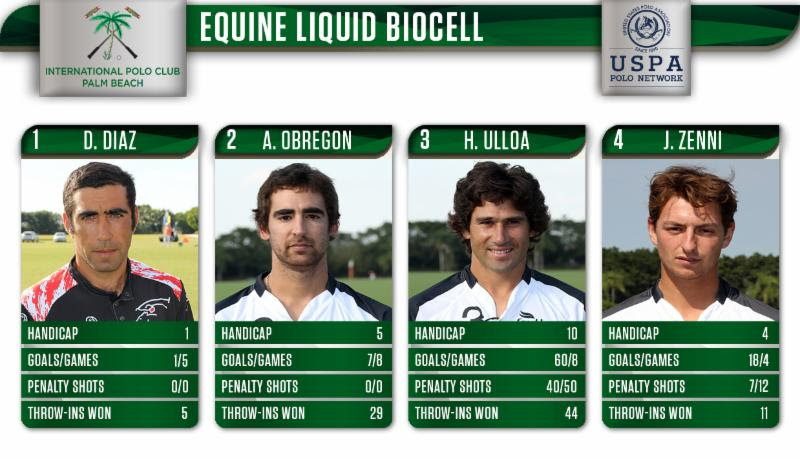 After both teams added one more goal in the third chukker, it was a tense 5-4 Equine Liquid Biocell lead at halftime. Tonkawa came out firing in the second half. They shot at goal 5 times, with Sapo Caset and Costi Caset scoring one goal each from the field. Sapo Caset added another goal from the penalty line, helping Tonkawa win the fourth chukker 3-0 and take a 2-goal lead (the largest lead seen at any point in the game). As was the case the entire game, the momentum switched back and forth. 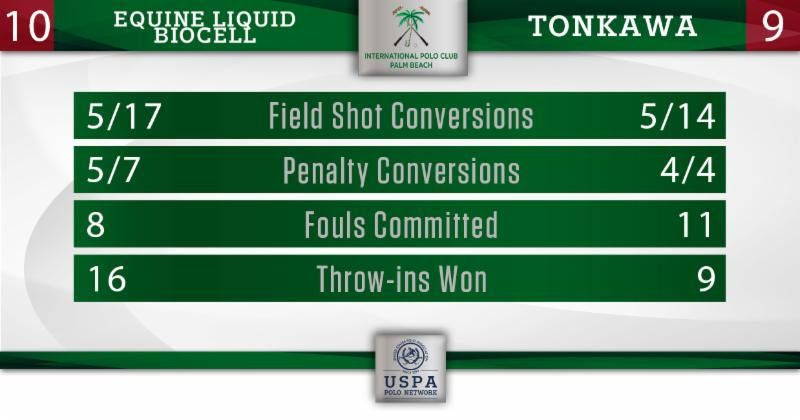 Equine Liquid Biocell controlled the fifth chukker, shooting at goal 5 times to Tonkawa’s 1 shot, but they were only able to convert one shot to bring the game back within one goal. 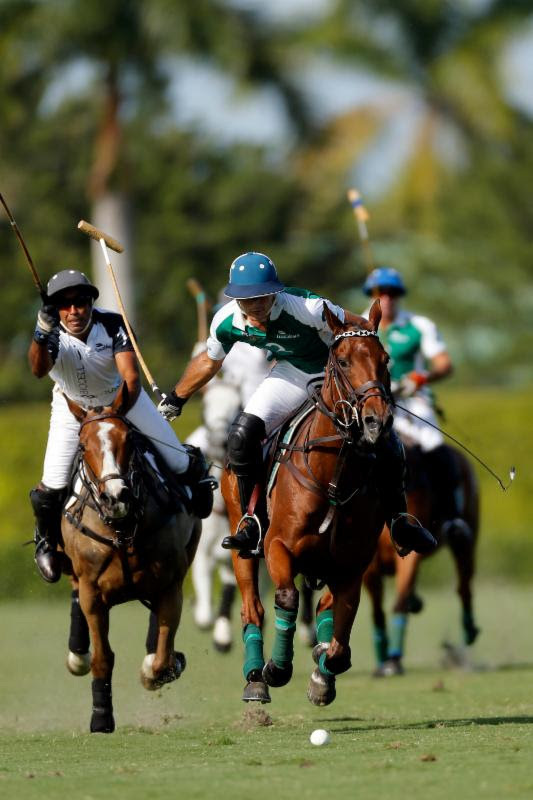 The sixth chukker tightened up with Sapo Caset converting both penalty attempts, going a perfect 4 of 4 from the penalty line on the day. Ulloa answered back, scoring one from the penalty line and one from the field, as Agustin Obregon also added his second goal on the game to tie the score at 9 and send the game to overtime. After an opening drive from Sapo Caset and a won challenge from Equine Liquid Biocell, Agustin Obregon got a foul call deep in Tonkawa territory. That led to a penalty 2 chance for Ulloa, which he converted for his seventh goal of the game and a 10-9 victory.